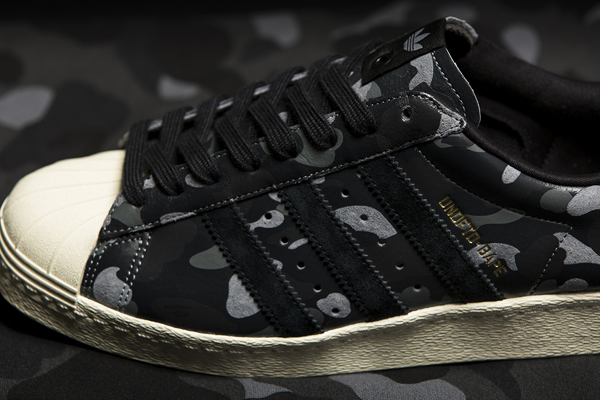 This fall, UNDEFEATED and A Bathing Ape® enter the second round of their collaboration on the classic Superstar 80v for the adidas Consortium series. 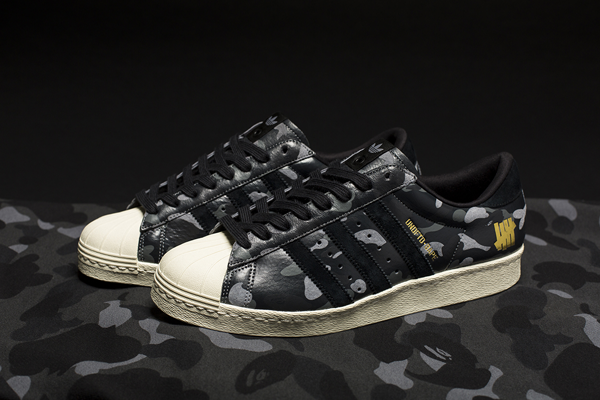 Earlier this year the BAPE® camouflage saw a comeback to the Superstar silhouette, a nod to adidas Consortium's initial project with the legendary Japanese streetwear brand in 2003. 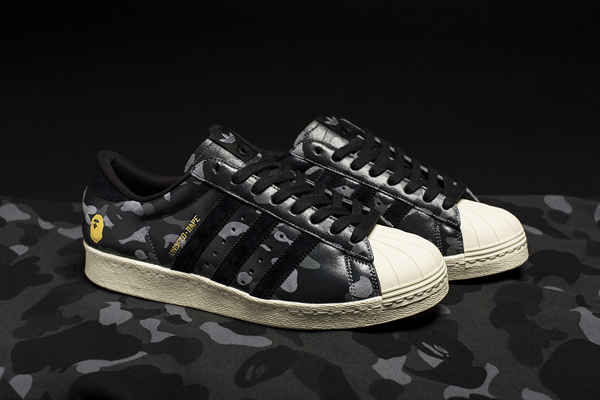 For their collaboration with UNDEFEATED, the US-based pioneer of high-end sneaker retail, this iconic pattern was rendered in two new and exclusive color palettes for the Superstar 80v. While on the first pack the camouflage appeared more subtle, for this release all restraints are lifted as an all-over print adorns the shoes' complete upper as well as matching laces. The resulting aesthetic exemplifies both partners' design approach which constitutes the constant, masterful balance between the subtle and subliminal versus the flashy and flamboyant. 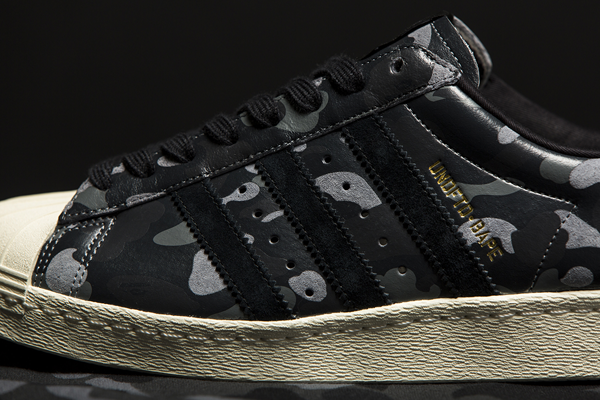 The second UNDFTD x BAPE® Superstar 80v is produced with a novel material treatment on black suede. One color was picked from the camouflage pattern as base-color for the leather dye and left out from the all-over print. The result is a stunning, highly tactile effect. 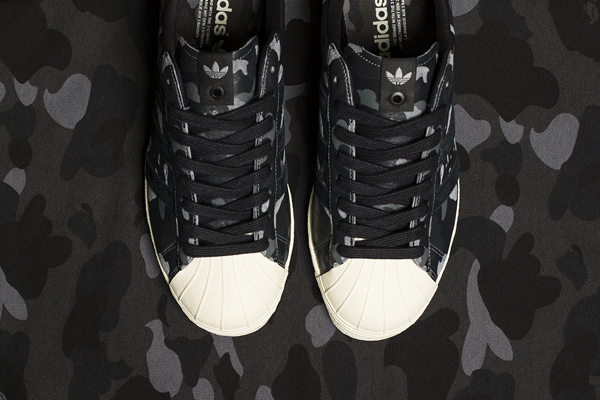 Slightly more subtle details include matching suede heel tab and three stripes as well as the camouflage insole print. Complementing the “all-over” effect are the camouflage laces which can be exchanged with a matching mono-colored set. As before, the gold embossed UNDFTD Strike Logo, BAPE® Head, and lettering appear as clear visual identifiers for this collaboration.